The bracelet shown is a 2-string bracelet Brain Cancer Grey Ribbon Bracelet. 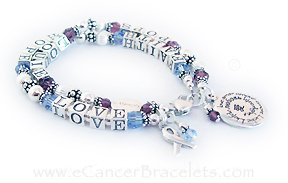 This bracelet has FAITH HOPE LOVE on one string and Tramiris on the second string with a SURVIVOR bead. They added a Heart Toggle Clasp, Angle Charm and a Prayer Box charm. The ribbon and dangle are included in the price. The bracelet below is a 2-string bracelet Brain Cancer bracelet. 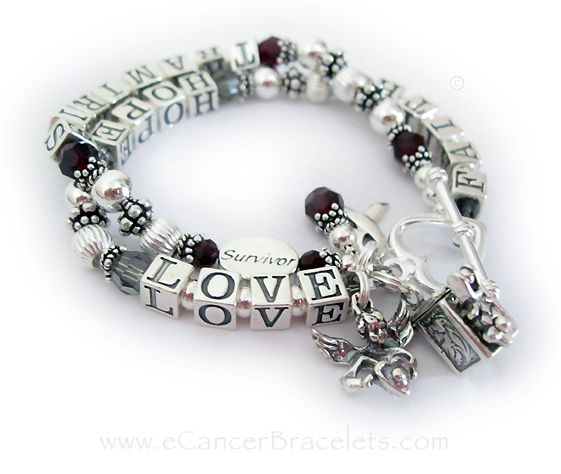 This bracelet has FAITH HOPE LOVE on one string and Tramiris on the second string with a SURVIVOR bead. They added a Heart Toggle Clasp, Angle Charm and a Prayer Box charm. The ribbon and dangle are included in the price. 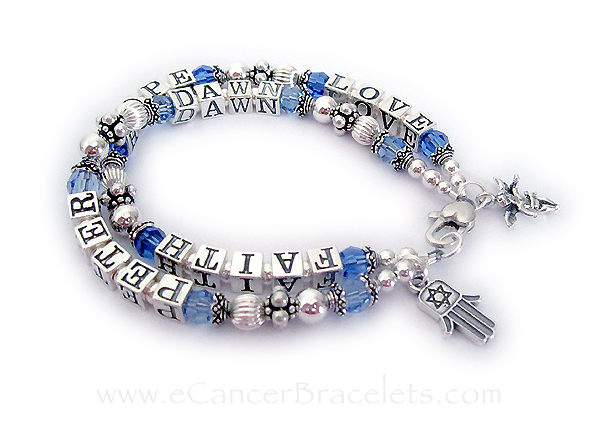 The bracelet is a 2-string bracelet with blue crystals symbolizing colon cancer. They put FAITH HOPE LOVE and dark blue crystals on the 1st string and Peter and Dawn on the second string. They switched out the free Ribbon Charm and Crystal dangle for a Hamsa Hand charm and an Angel charm (free exchange). They upgraded to a Heart Lobster claw clasp. Please contact me if you want to switch out the free ribbon charm and dangle for 2 other charms.